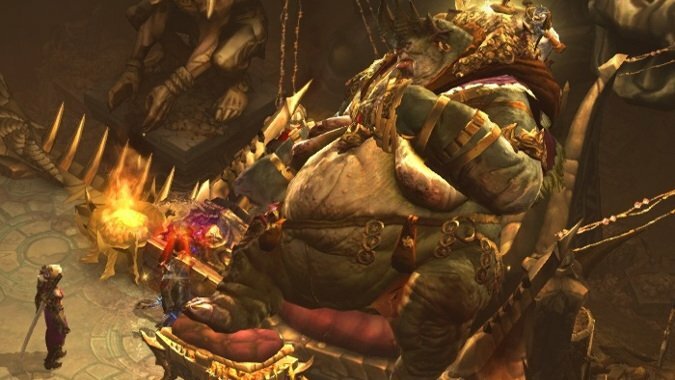 In Diablo 3, Season 14 has just begun. It’s the game’s first themed season, and it’s the Season of Greed. So in honor of this, the greediest of seasons, I’m going to tell you a story. My wife and I play Diablo 3 together. We’re looking forward to playing Season 14 together. We’ve played several previous seasons together. And thanks to this, the second we hear a Treasure Goblin, we have a finely honed reaction which amounts to “Goblin? Goblin!” and it consists of us literally dropping everything we were just doing, whatever it was, and running around like mad people chasing a Treasure Goblin through pack after pack of demons and undead until we finally kill the thing. In other words, the only real advice is “Drop everything and focus all the damage you can on that goblin” here. Do you have a means to damage the goblin over time? Use it. Do you have a huge damage attack ready to go? Use it. Cooldowns? Pop them. 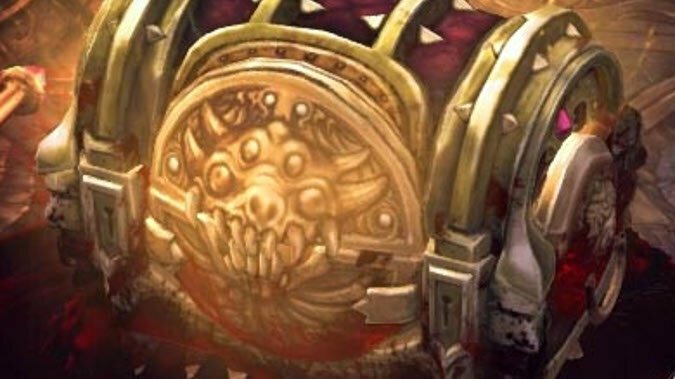 I have been in the middle of methodically grinding down a mess of demons, heard that Treasure Goblin noise, and popped Call of the Ancient immediately upon sighting it so many times now that it’s a reflex. If I hear that sound in a video, my hand immediately goes for the 3 key. That’s where I keep it. But you may be asking What are Treasure Goblins? Treasure Goblins are, as far as I have been able to determine, goblins that drop treasure. They live in a strange realm of their own with twisted passages and loads of treasure on the ground called either The Vault or Greed’s Realm, because of the giant demon named Greed that makes it her home. Greed is a voracious collector of all that stuff we adventurers want, and so, when a portal to Greed’s Realm opens, be it through us putting a Puzzle Ring into Kanai’s Cube or upon killing a Treasure Goblin who randomly opens a portal there, it is our duty to go through immediately and kill as many Treasure Goblins and smash as many containers as possible, because we will be literally showered in treasure. Gold, gems, all that kind of thing. Like everything else in the game, Treasure Goblins spawn randomly all over Sanctuary, though some people have their own farming routes to try to catch them. When you find one in the world, it’s usually in the midst of a bunch of other demons. It will usually begin running around dropping treasure like a pinata as soon as you start hitting it, and it is your responsibility, nay, duty to hit that demon like it owes you the money, Blood Shards, gems or other treasure that it drops as it runs around the battlefield, drawing even more demons on top of you. Ignore them as much as possible. You can kill them after the Treasure Goblin is dead. 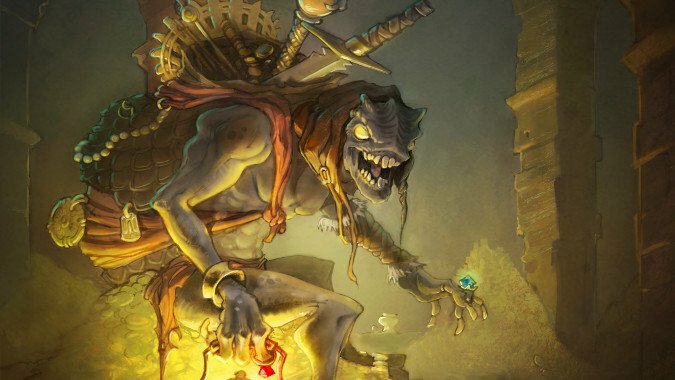 Treasure Goblins can be identified by color, but a few things are common. One, they do not attack you — they endanger your life solely by running through as many other demons as possible, drawing them down on you. Second, if you don’t keep hitting them, they will open a portal to Greed’s Realm and escape, leaving you unable to kill them. Remember ABHG — Always Be Hitting Goblins. Never stop. Never do anything that doesn’t help you keep pressure on that goblin. Keep it from casting that portal, keep it damaged, use whatever abilities you need to in order to stay upright and just. Keep. Hitting. That. Goblin. Eventually it will die and you will get the loot, just Always Be Hitting Goblins. Finally, with the exception of Freeze and a few Knockbacks, no Slows or indeed any Crowd Control at all works on Treasure Goblins. You need to keep on them, chase them down, and apply damage to them as often as you can. They will run away from you at high speed to get far enough away to open and escape into a portal, so don’t stop to deal with trash hitting you — just Always Be Hitting Goblins. If you have slows or CC’s, use them on the demons so you can escape and keep chasing that goblin. Anything you can do to catch up, like Leap or Vault? Do it. Always, always be hitting those goblins. There are different kinds of Treasure Goblins that do different things. These include the Rainbow Goblin, who drops a portal to Whimsydale. There’s a buttload of treasure there (yes, an actual buttload, a metric buttload to be precise) so yeah, kill that one dead. Then there are Malevolent Tormentors, who drops a ton of Legendaries the higher the difficulty of the game is and who can teleport so yeah, find and kill these guys asap. And there’s the Menagerist, which, if you like non-combat pets or play with someone who does you’re gonna want to find and kill immediately. 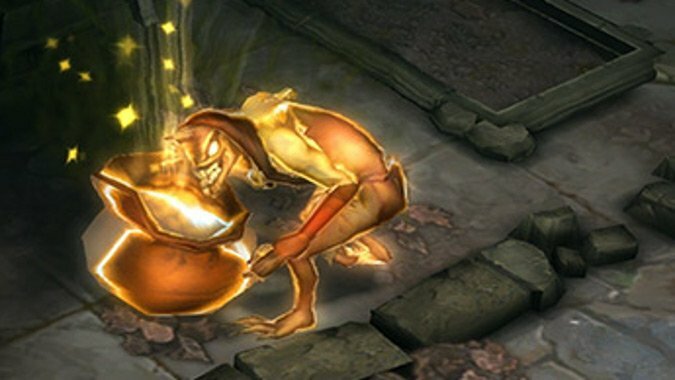 In general, the advice for dealing with any Treasure Goblin is find and kill immediately — always, Always Be Hitting Goblins. I hope, if I’ve taught you nothing else, I’ve at least taught you to immediately drop everything and go into an atavistic murder frenzy fixated wholly on the Treasure Goblin the second you hear one, find it, stick to it like glue, do anything to keep close enough to it to keep hitting it until it is dead. Never stop. Always, my friends, Always Be Hitting Goblins.